Planning your own wedding is not an easy task, but when you and your life-partner to be share the same vision and the same passion, it can turn into a memorable experience rich in deep emotions and lots of fun. For the perfect outcome professional help is needed of course, too. Yet most important is to stay positive and enthusiastic at all times. This is the key to having your dream wedding day. 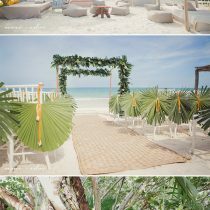 Here’s the exciting story of a happy couple who got their perfect intimate beach wedding in Punta Cana paradise. “Bri and I knew we wanted a small wedding from the beginning. Both being beach lovers we also knew we wanted to get married with our toes in the sand. That being said we started off researching destination weddings. 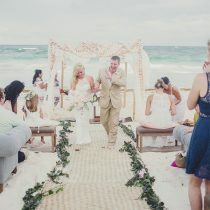 I found a travel agent from Wedding Wire and away we went! She was my side kick throughout this whole process; I don’t know how I would’ve managed pulling this off without Denise. We ended up choosing Punta Cana as our location. We invited our parents, brother and sisters their wives/husband and all of our nieces and nephews. 22 of us total. It was going to be a family trip of a lifetime and a beautiful wedding to go with it. I had a vision in mind from the start. I love, love, love succulents and greenery. I began to start collecting every brass and pewter candle holder I could get my hands on. It became a weekend venture for Brian and me. We would go out hunting for items at flea markets, yard sales, antique stores, little boutiques… you name it. It was fun for us, we enjoyed our time together and made memories that we’ll cherish for a lifetime. I wanted one long table so we could all sit together as a family. I began chatting with a decorator I found in Punta Cana. Her name is Val, and she is AMAZING!! As soon as I started showing her pictures of my things and describing to her what I wanted she fell in love with everything and that’s when I knew we would be a perfect team. We were a match made in heaven. I knew I wanted to hire her as soon as we talked the first time. From there on, we would meet and talk every other day, sharing ideas and getting so excited to finally MEET and make my vision come to life. I put a lot of heart and soul into everything I brought with me on that trip. I made welcome bags for everyone with necessities and goodies inside, as well as some fun things for the kids. As favors I made dream catchers for everyone. I lugged (and our parents helped too) 6 bags of wedding decor and gifts for our Dominican dream day, and let me tell you it was all WORTH IT! Bri and I left a day earlier than everyone else. When we arrived you could not wipe the smile off either of our faces even if you tried your hardest. We sat out on our balcony next to each other and for a moment the feeling of pure bliss and happiness just took over and tears flowed. We couldn’t have been happier; that’s how we felt at that moment. Here we were in beautiful Punta Cana, just checked into our room taking in the scenery, the fresh air, the scent of the ocean with my soon to be husband by my side and our families on their way. It was a moment I’ll never forget. For the last year we had worked so hard for this, to get ready for this and here it was!?! Our day was nothing short of amazing. It was everything I dreamt of and more. It was truly the best day of our lives, a day I will cherish forever. Nothing went wrong, not one thing. Everything was absolutely beautiful and what I had hoped for. Val from Valswedding and the team at Now Larimar were spectacular and a pleasure to work with. I wouldn’t have changed a thing. We closed the night dancing as a family on the dance floor under the stars with the ocean behind us. A memory I’ll keep with me forever.